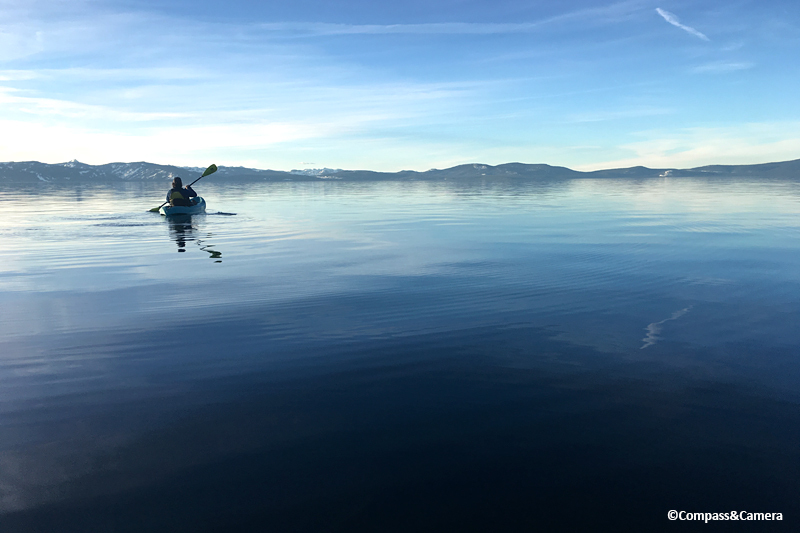 It was only about two weeks ago that we went out for a winter kayak on Lake Tahoe. The water was so placid it felt like an illusion — like sitting on a mirror. 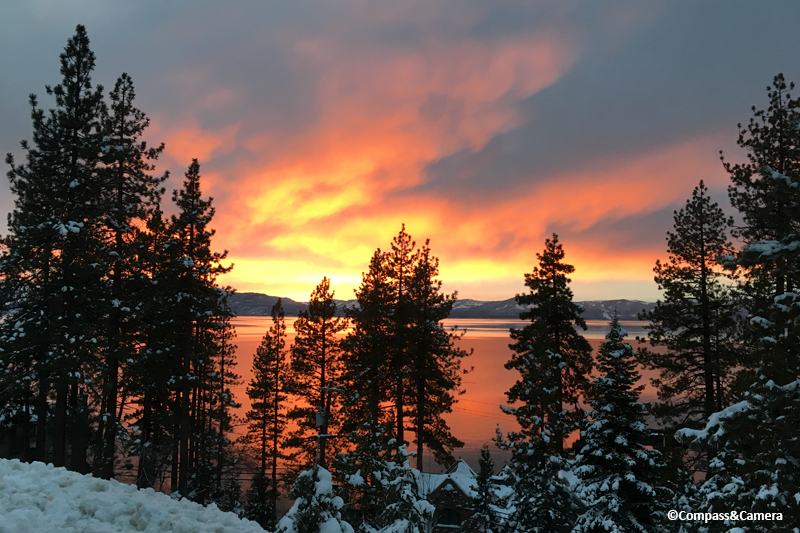 The sunsets had been stunning and there was no hint of the snow yet to come. The calm before the storm. 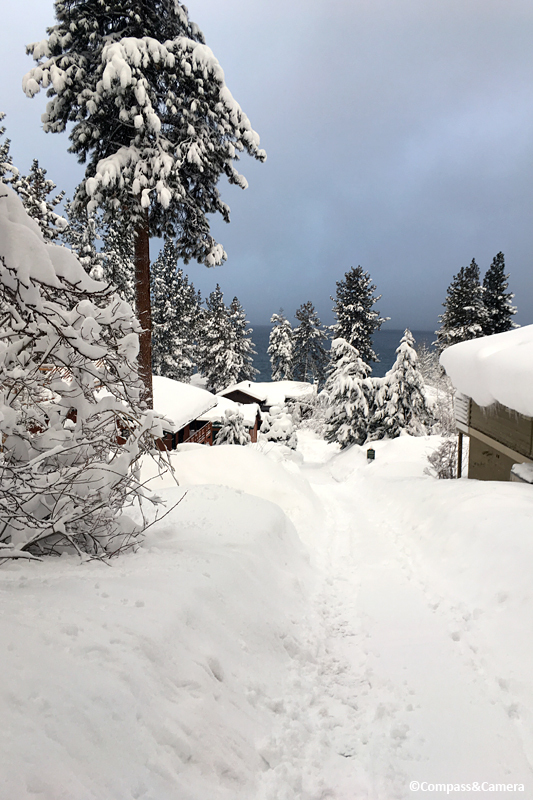 Since then, it hasn’t stopped snowing and snow totals for the month have topped 200″ at most resorts around the lake. 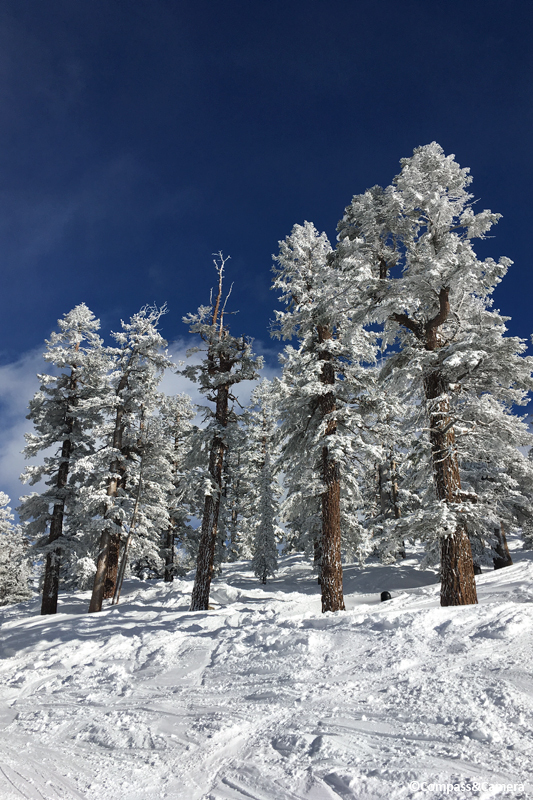 Season snow totals are topping 400″ (492″ at Squaw Valley) and it’s only February. 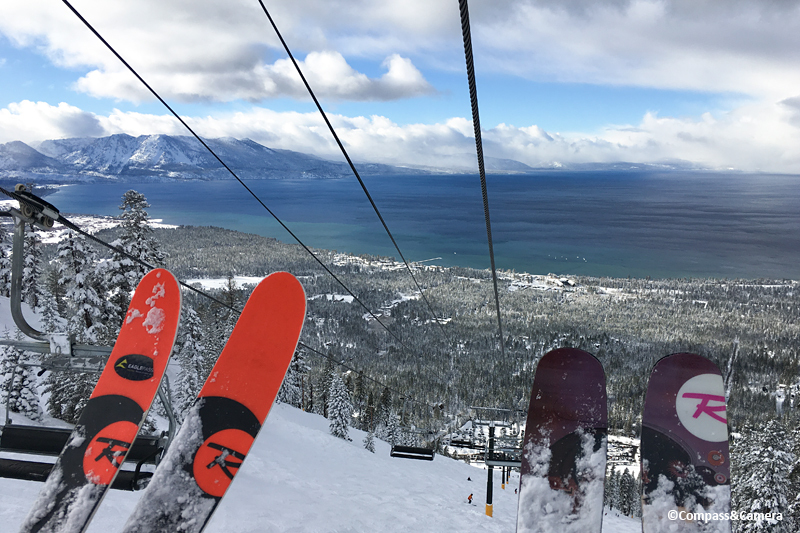 We’ve had some breathtaking ski days at Heavenly. 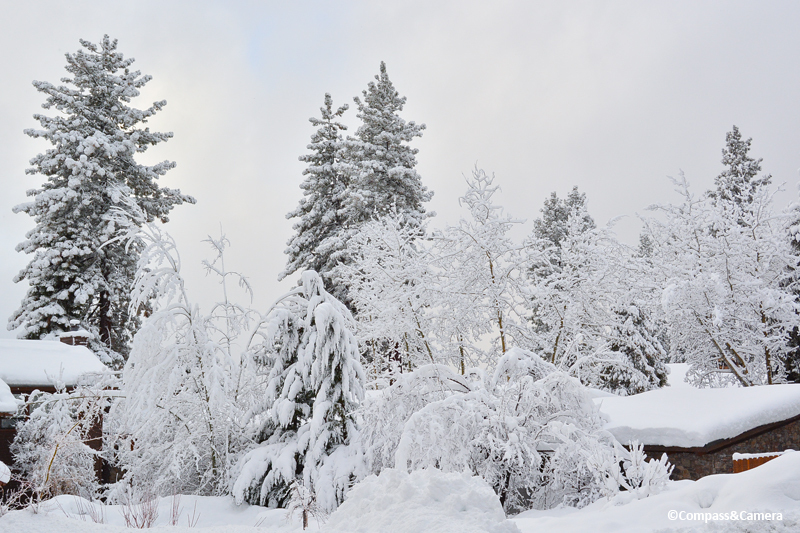 The views around the house have been pretty spectacular, even if it’s meant shoveling out every few hours. 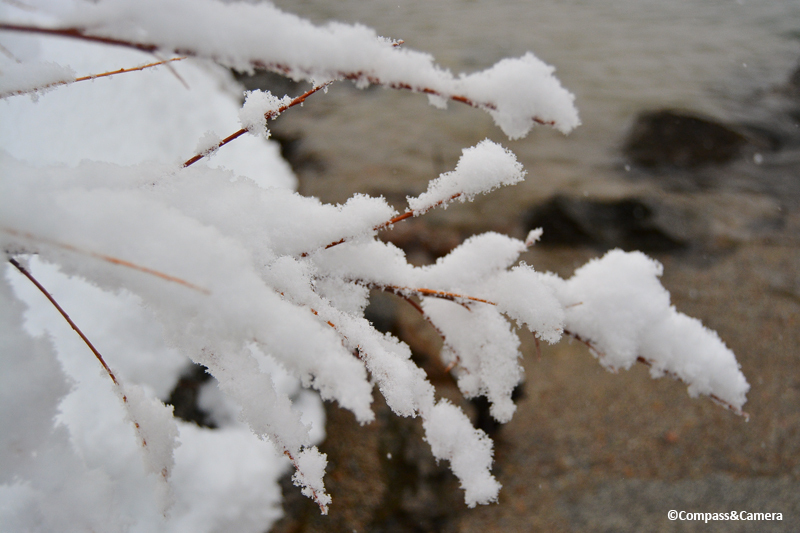 From white-outs to brief moments of small flakes, the snow has been relentless. 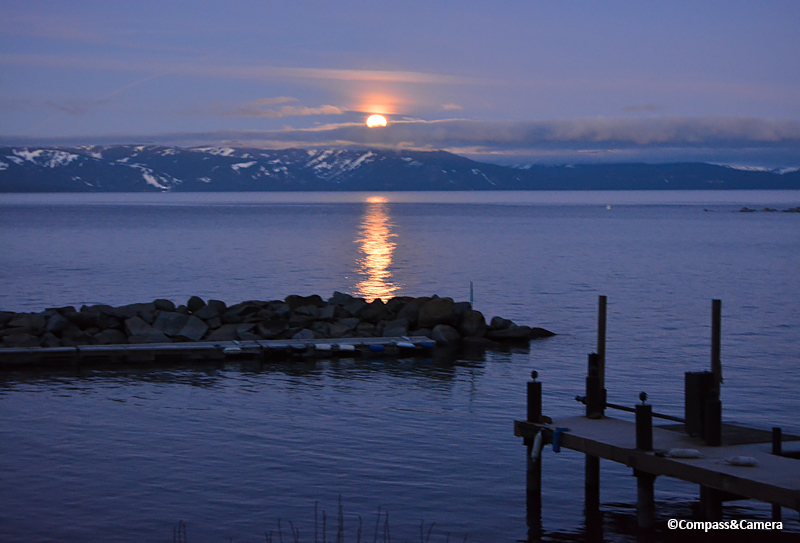 The color of the lake shifts constantly with the weather, from light gray-green to the deepest, most beautiful sapphire blue. 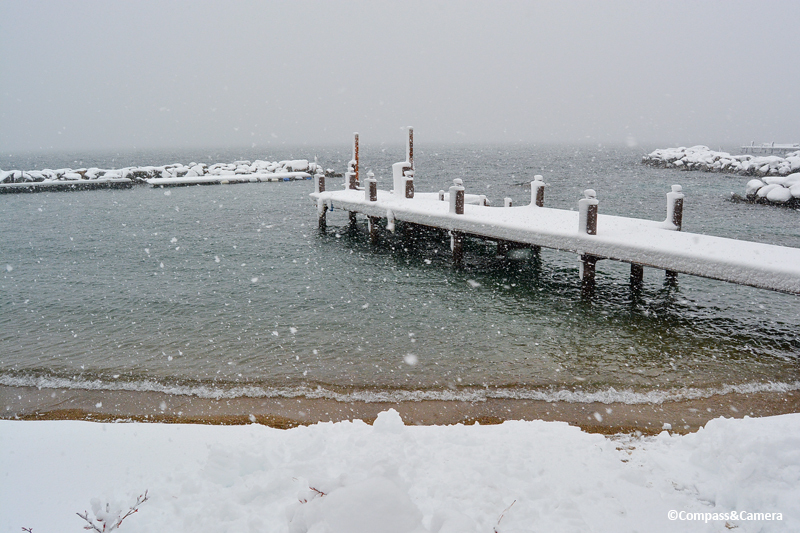 Here’s to a deep winter and a full lake for the summer. I already can’t wait for long hikes, paddle boards and cocktails at sunset. Cheers! I’ve missed you. Today I reconnect and say hello to whomever may be listening. My voice has been quiet, muffled by the events of life. Writing is a practice and when life presents twists and turns, the time and space to write becomes harder to locate. 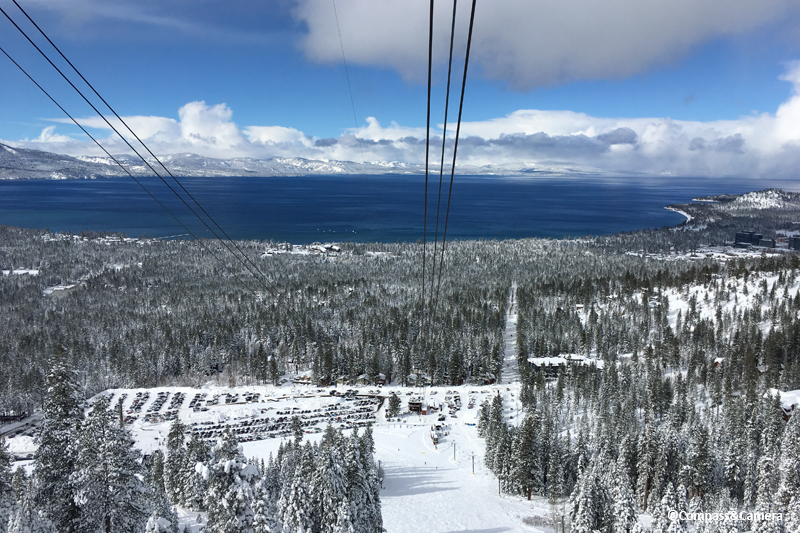 But now, I’m sitting beside Lake Tahoe – facing west! – making up for three years of facing east, missing the daily sunset from my perch in Vancouver. I’m adjusting to life in the U.S. after living out of the country – first Singapore, then Canada – for nearly seven years. This, I’m only now realizing, requires more adjustment, thought and reflection than I expected. I was a different person when I left and I’m a different person upon return. And in some ways I barely recognize my own country in turmoil. 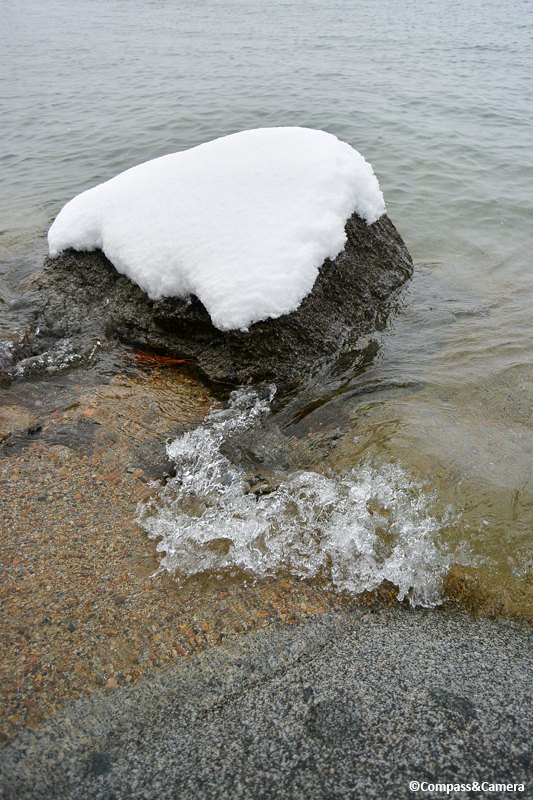 But life moves forward and change is invigorating. Choice is invigorating. Do I choose to live passively and be guided by what most people would think or do? Or do I choose to live actively, with a dash of discomfort, leaping into the realm of the unknown while knowing absolutely that this is where life’s greatest rewards are found? 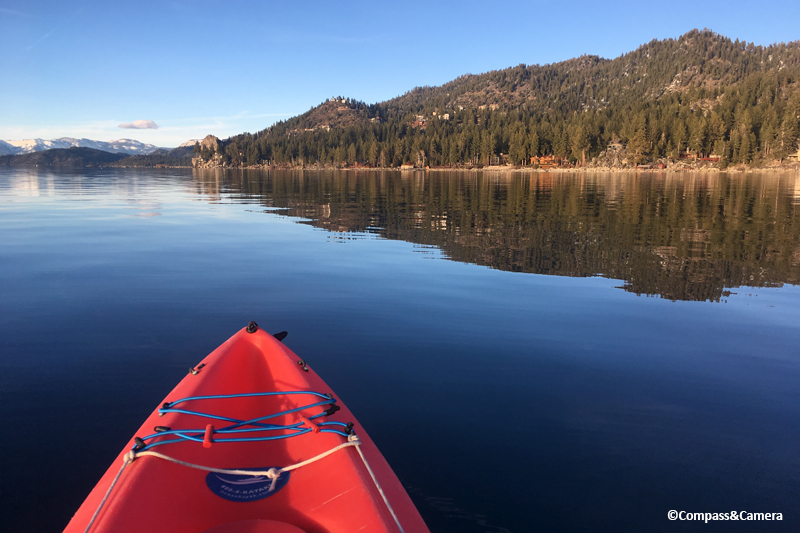 2018 was an unexpectedly rewarding year: Tulum, Paris, Nuremberg, and cabin life at Lake Tahoe, none of which were planned more than a couple weeks in advance. We (hubby and I) look for opportunity at every turn in the road. We seek to enjoy life – in the moment, every day, now. We don’t wait for enough time or enough money or enough anything. We choose now because the world is changing. The thing you most want to see or do in life may not exist some time from now. Simple moments – standing freely under the Eiffel Tour as we did 10 years ago – have already been stolen away, gone to a new era of barriers and fear. I wish you specific happiness in 2019. I hope you see or do the one thing in life that you’ve always wanted to, before it’s too late. Be fearless. 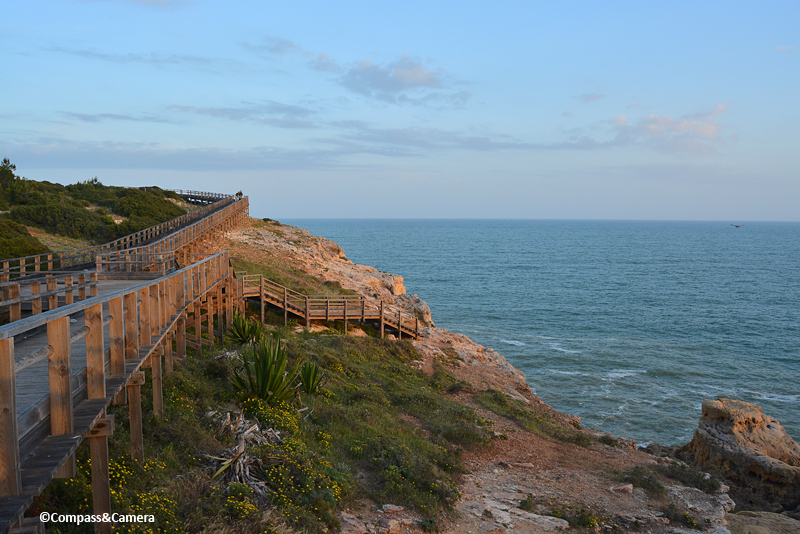 Walk a path, take a flight, open a door, lend a hand, experience the world, near or far. I’ll do the same. I’ll get back to sharing my world and my travels if you’d like to come along. I’ve craved it. I’ve missed it. I’ve missed all of you who savor the thoughts and images that only a magical world can provoke and produce. Let’s believe in the magic and go forward with gratitude. 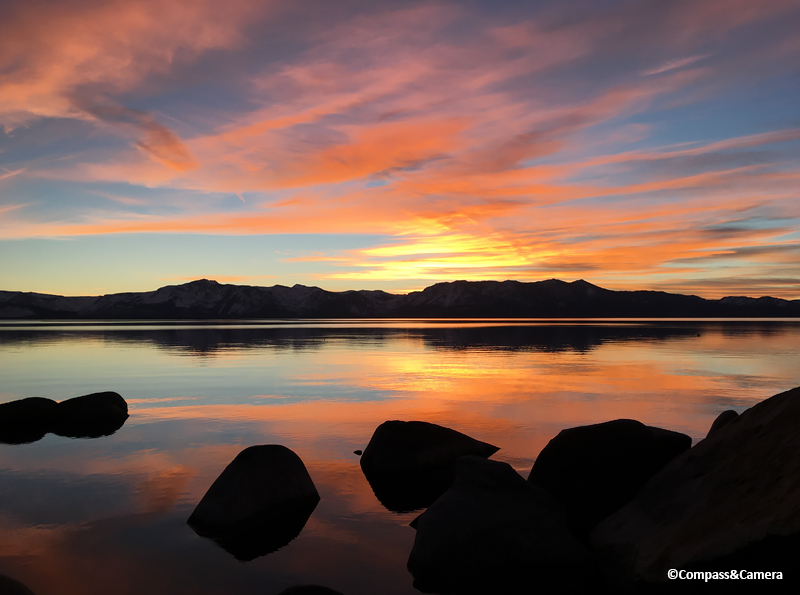 With an active mind and an open heart, beauty and opportunity are everywhere. Happy New Year. We’ve been here for one month visiting friends, working remotely and relaxing in Tulum, Mexico after leaving Vancouver, Canada. Many have asked what we’re doing and we don’t have an immediate answer to that question. We’ve embarked on a nomadic lifestyle, at least for now. We’ll see how long it lasts based on budget, desire and knocks on the door from my husband’s world of film and visual effects. We came here for tropical heat, cheap tacos and a slower pace of life. We’ve found all of that plus a few adventures, some big surprises and an alluring dose of Mayan history. We’ve been staying in a great apartment on the edge of town, which also happens to be a 20-minute bike ride from the Tulum ruins. I’ve been to the ruins once before — about 15 years ago — but that was long before history and culture really began to make my heart beat. Being here again, in the context of the Yucatán Peninsula, has been given me a new awareness of the richness and depth of culture in this region. The highlights of spending time here have included watching the Travesia Sagrada, and learning about the vast network of caves and cenotes below the surface of Tulum and its neighboring towns. The Travesia Sagrada honors a historic journey from centuries ago. 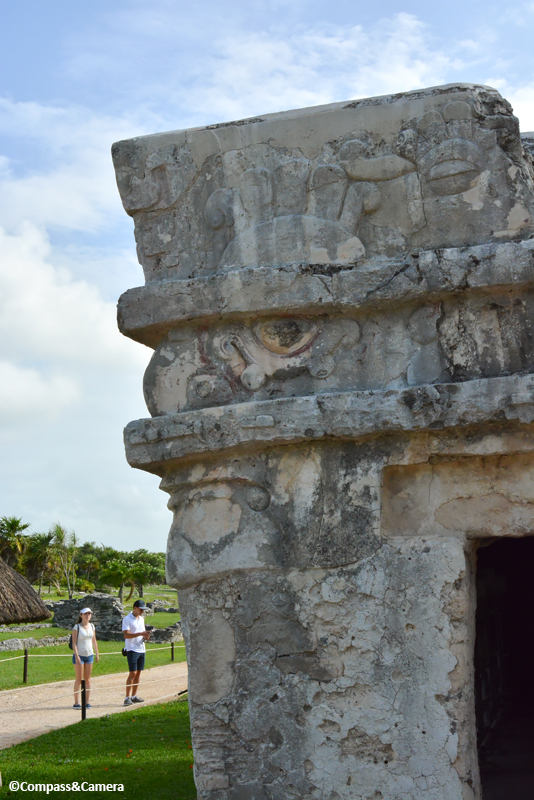 Mayans traveled by canoe (departing north of Tulum) to the sacred island of Cozumel and its temple honoring Ixchel, goddess of the moon and fertility. The pilgrimage was important for women hoping to have children and men praying for a good harvest. Nowadays, about 300 men and women in 30 canoes row to Cozumel and return the following morning. In the process of learning about the Travesia Sagrada through a friend who participated, I’ve also learned about temescals (sweat lodges) and a Spanish bishop named Diego de Landa who single-handedly did more than anyone else to both record and destroy Mayan culture. It was de Landa who documented the travesia in the 1500s, but it was also de Landa who burned essential Mayan manuscripts and images out of his religious intolerance. As for the caves and cenotes here, they may be Tulum’s most enjoyable secret, although they’re not really a secret. Many people know of them but they aren’t too overcrowded. Yet. Typically, a cenote is a large hole in the ground that leads to a larger hole filled with fresh water draining to the ocean. Most cenotes are very deep (in some, you can’t see the bottom) and often connected to other cenotes by caves and channels. If you’re an adventure scuba diver, cenotes are a unique paradise. 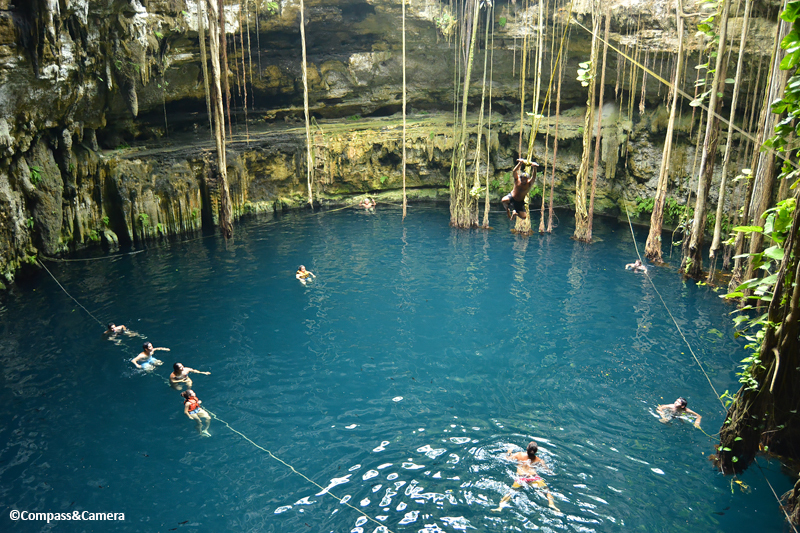 If you’re not comfortable in the water, you will hate cenotes. They can be very dangerous if you’re inexperienced, unprepared or your equipment fails (which Jay was witness to at a cenote/lagoon south of Tulum). 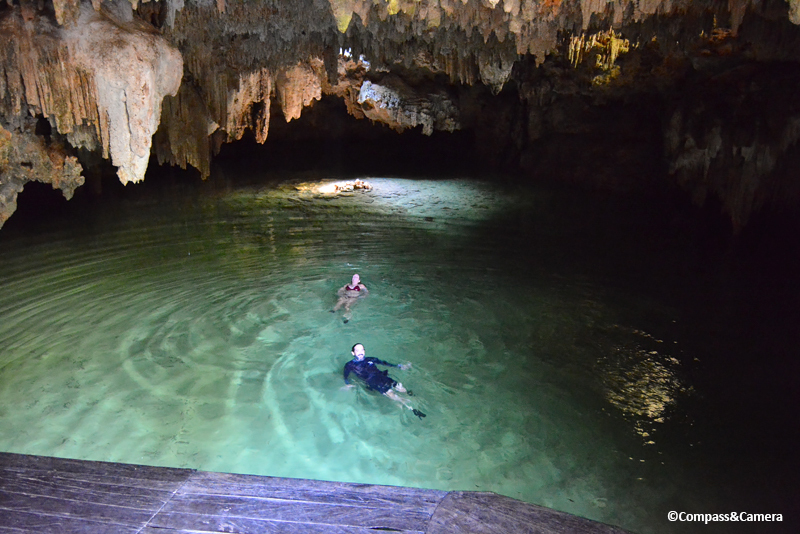 We explored Cenote Labnaha with a guide, which was both fascinating and freaky. For one hour we snorkeled through low caves, dodged stalactites, looked down at the scuba ropes leading into even deeper caves, and turned off our flashlights to 15 seconds of complete and terrifying darkness. Cenotes played a part in Mayan history as a place of worship and sacrificial offerings. 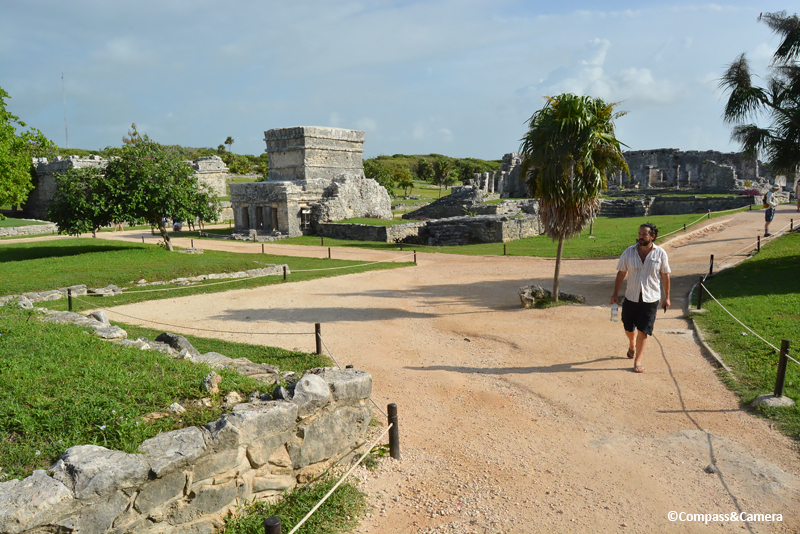 The Tulum ruins include a “House of the Cenote” and at Ek Balam there’s a cenote visible from the La Acrópolis. Our next door neighbor, who we call the Jacques Cousteau of the Yucatán, has been exploring and mapping Tulum’s network of caves and cenotes for the past two decades. He’s found artifacts and human remains in several. 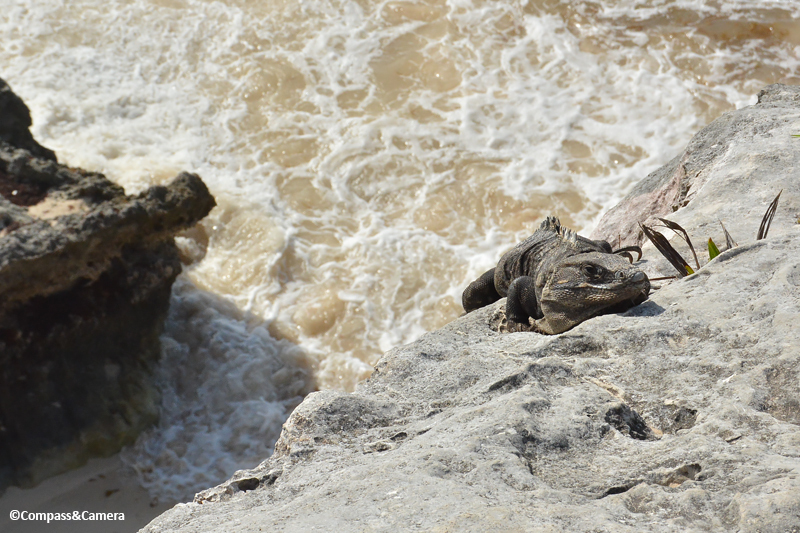 Tulum itself is a gritty little town with upscale construction threatening its charm at every turn in the road. It’s straddling an impossible line between retaining its character and leveraging the considerable foreign interest it holds as a seaside destination not far from Cancún. A bigger, pressing issue may be global warming. The coastline here is showing signs of the battle — not against trash, but against a super-bloom of sargasso macroalgae that is relentlessly dumping ashore in a rotting brown mass (pictured above). No one can keep up with it and hardly anyone is hanging out at the beach as a result. In addition, Mexico’s elections are just a couple weeks away and running for office here can be a life-threatening pursuit. This is a country battling many forces against it, including its neighbor to the north. Beneath all of this patina, the history here shines brightly. The region is punctuated by the magnificent temples of Chichen Itza, Ek Balam and Cobá, and countless smaller sites cover the peninsula. It would take weeks — if not months — to see them all. Yet it feels like layers and layers remain to be discovered in the crumbling limestone and tropical vegetation. 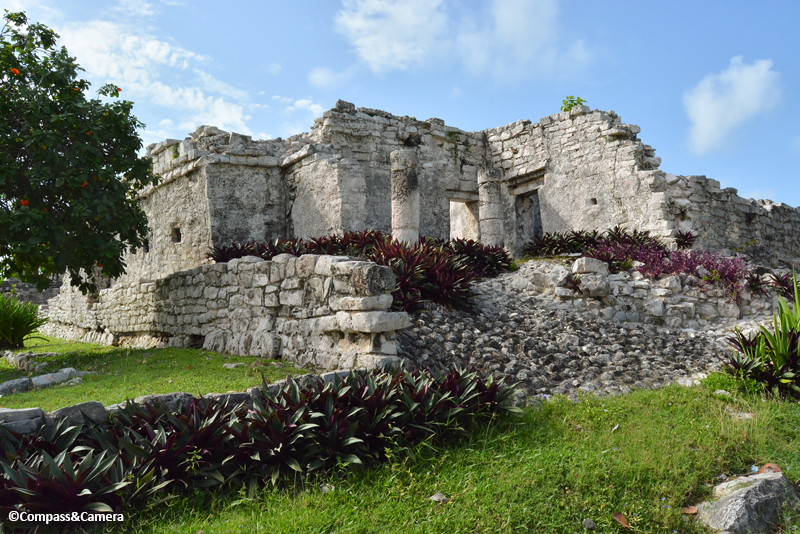 The Tulum ruins stand alone as a unique coastal site — the only one in Mayan history — and old port for the city of Cobá. 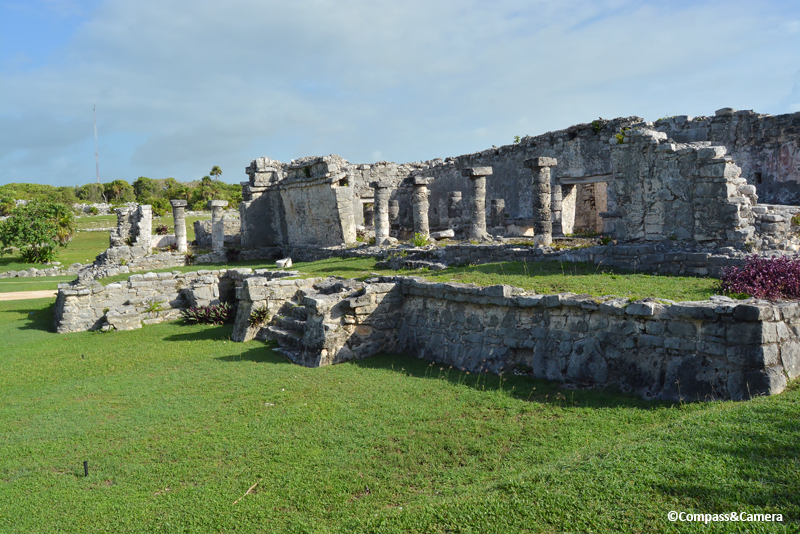 Originally called Zamá (dawn or sunrise), the site of Tulum flourished from 1200-1500 AD, and declined in the 75 years after the Spanish made first contact in the early 1500s. 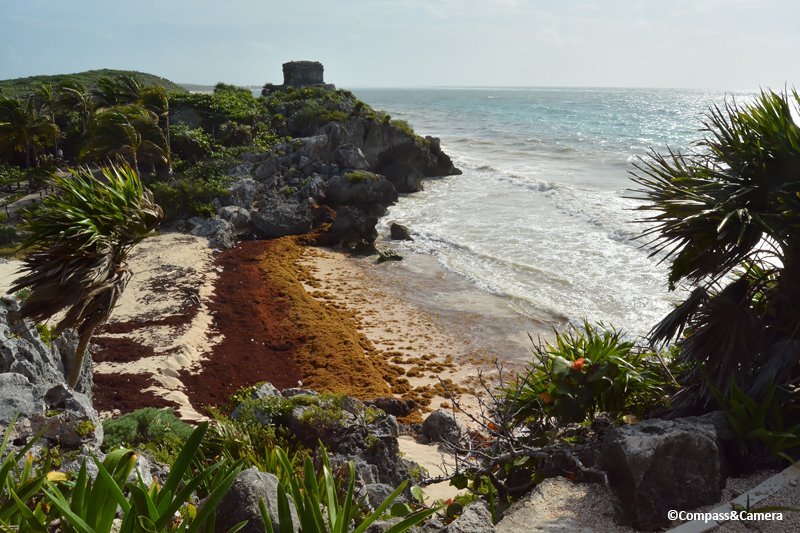 Between 1,000 and 1,500 people lived at Tulum. Based on the wall with four small doorways protecting the ruins, people living within the site may have been of a higher social class than people living outside the wall. 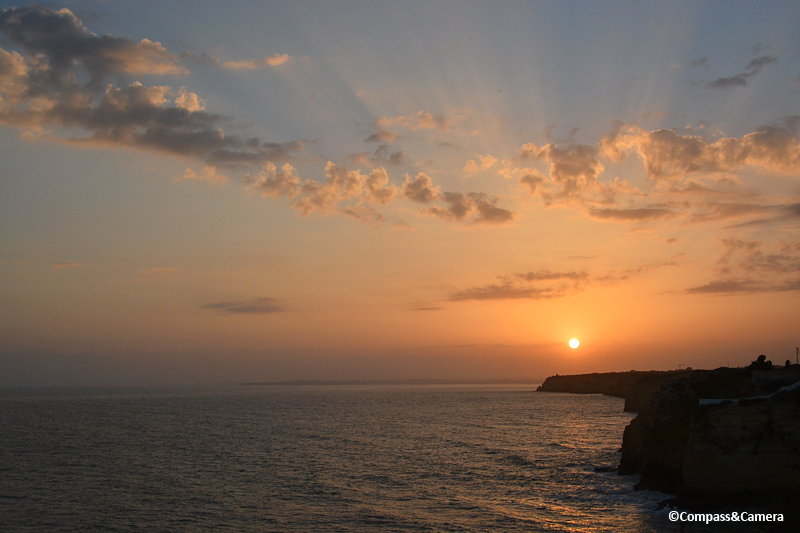 El Castillo (The Castle) sits at the cliff edge overlooking the ocean. Surely the view is spectacular from it’s highest level although you’re not allowed to climb the steps. Standing alongside the east wall facing the sea, it dominates and feels fortified against the weather with its battered construction. But the articulation of the stone ledges and borders adds delicate beauty. Whoever designed the castle and surrounding structures had an evident appreciation of design and proportion. 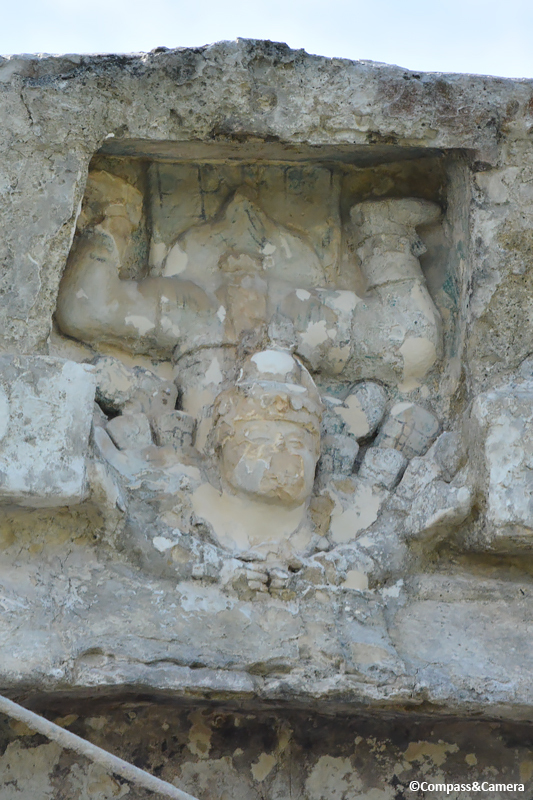 The Descending God, a notable deity of the Yucatán peninsula, is portrayed at the Tulum Ruins. This figure holds a characteristic pose — inverted, with feet at the top and face at the bottom looking forward. The Descending God is associated with bees and war, and interesting combination. Honey was a vital export of the region and war was a way of attaining power. You can read more about the Descending God here. The Temple of the Frescoes holds weathered depictions of deities above the colonnade. Even a bit of color remains from the natural pigments (achiote, chochineal and palygorskite or Maya Blue among them) that once painted the sites of this region but have since washed away. What I find most striking about Mayan art is that it so closely resembles the style of indigenous art throughout western Canada. The depictions of gods and animals in both regions share a highly graphic quality of thick lines, robust shapes and bold expressions. Is it coincidence or relation? Walking around the rest of the site, all of the structural remains have simple rectangular footprints with finished-floor elevations above ground level. Could the varied floor heights have indicated status even within the social hierarchy of the select people living here? Could this detail have helped keep the bugs and reptiles out — of which there are many! Or the rain? Did the added elevation simply keep the floor dry? It has rained in solid sheets over the past few days so this had to have been a concern at such an exposed site bordering the ocean. There are so many unanswerable questions, lost to the forgetfulness of time. Even I have questions related to my own life that have surfaced while being here. When I was a kid — four or five years old — I had two imaginary friends for a period of time. I have no recollection of how I conjured them up. I only remember their unusual names: Chaka and Cobba (as I spelled them). Since coming here, I’ve learned two interesting names that correlate: Chaahk, the Mayan god of rain and Cobá, the historic Mayan city that once dominated the region. Have I lived here before? Is it coincidence or memory? Last March, we decided it was time to pack up and leave Vancouver — such is the life of opportunists and world travelers always looking ahead to the next stop. But before we left we were surprised with one late-season, last-minute opportunity to see the Northern Lights — a big item yet to be checked off our bucket lists. 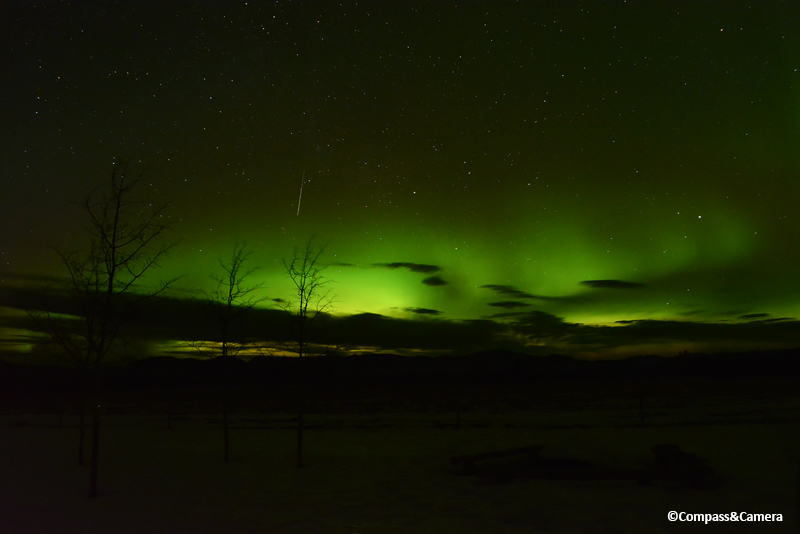 Forecasts predicted the Lights would be active over the coming weekend due to a coronal hole and resulting solar wind entering earth’s atmosphere. Yay, science! 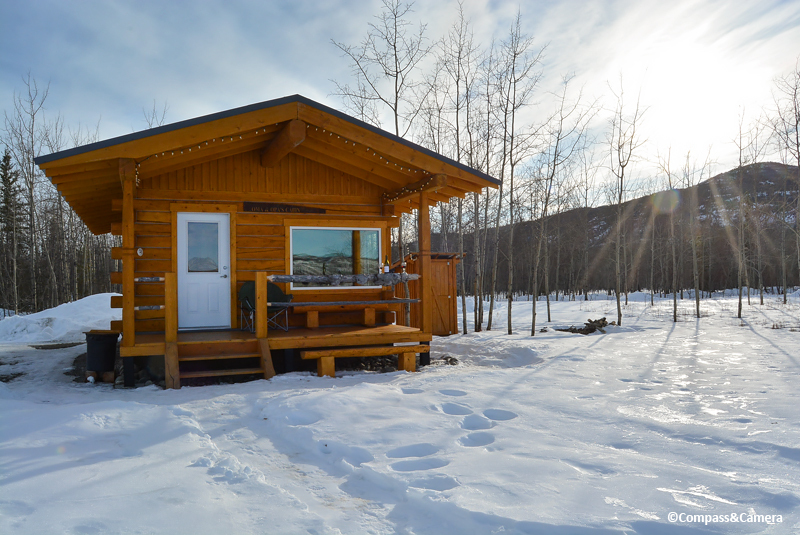 We did what any ardent Northern Lights chasers would do: we booked a last-minute flight and a tiny remote cabin in the Yukon Territory. Two days later, we were fastening our seat belts for a long weekend in the middle of nowhere, in search of the Unicorn of the Sky (Jay’s name for the Northern Lights). “Nowhere” doesn’t do it justice. The flight to Whitehorse was full of spectacular mountain views and the town itself is pretty cool. 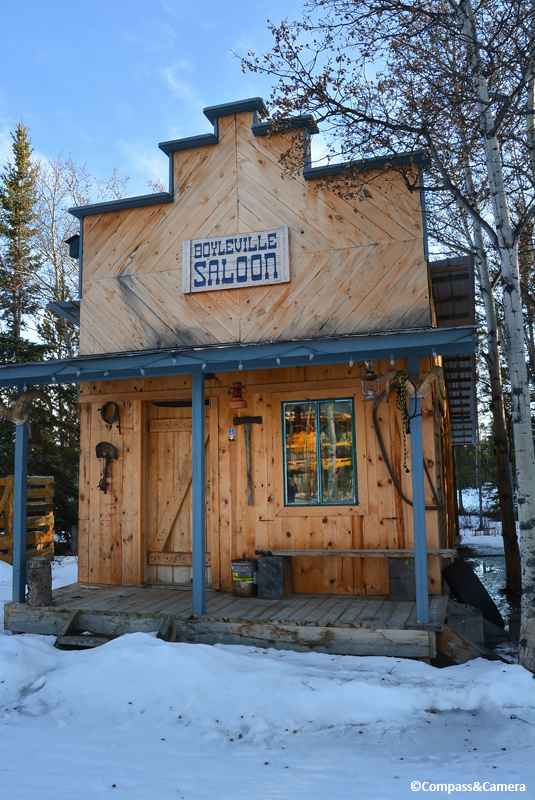 Whitehorse has managed to hang onto some of it’s vintage charm, blended with indigenous art and a new community center, interspersed with a few little shops and cafes. The best thing about the weekend was our one-bedroom cabin on the 80-acre ranch of a Renaissance outdoorsman. He milled the wood and built the cabin himself with a fantastic front porch and firepit facing directly north to the horizon where we hoped to see the elusive green glow of the Aurora. The cabin had no running water but the luxurious outhouse was far better than some bathrooms, and the efficient heat and fast WiFi made the whole outpost perfect for our weekend camp. 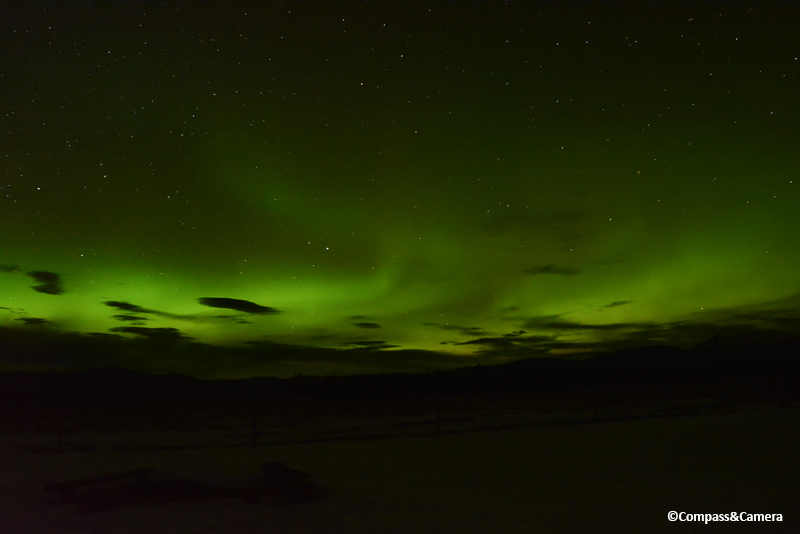 Located 45 minutes outside Whitehorse, the sky was plenty dark for our adventure in light. On the afternoon we arrived, we explored the vicinity of our cabin and discovered other myriad things the Renaissance outdoorsman had built including a handful of additional cabins, an enormous solar array to power the site, and the “Boyleville Saloon” just beyond his backyard (closed for the season, but probably host to some really fun parties). SO excited for the run! To the east of his home, he had a large yard and housing for a team of 30 sled dogs, and his wife tipped us off that he’d be taking some of them out for an “afternoon run” around 4:30 p.m. (Fun fact: You probably don’t know this, but I wrote the introduction to a sold-out coffee table book about Iditarod sled dogs called Born To Run by Albert Lewis.) Seeing these dogs here in person, from behind the fence (they are VERY enthusiastic creatures), was an unexpected treat. All hooked up and harnessed to run, OFF THEY WENT barking madly and racing for the hills. They didn’t return until 50 kilometers and one frozen river crossing later, in full darkness at 10:00 p.m. that evening. That same evening was the first time we saw the Northern Lights. I was using three websites to track the activity. The Lights had been extremely active over Scandanavia but by the time they reached western Canada, they had calmed to a sleepy Level 2 — nothing too special, but still a fuzzy green glow above the distant mountains to the north of us along with a blob of light above us that was so subtle I mistook it for a cloud until I realized it was shifting in all directions. 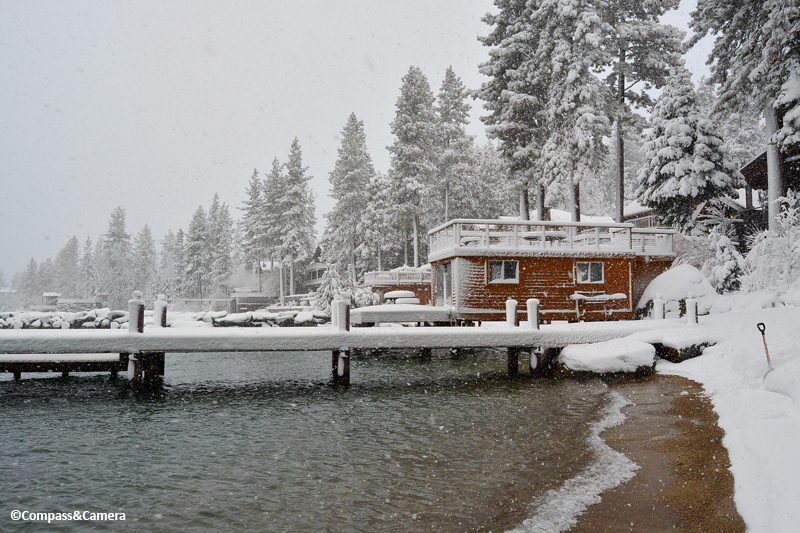 We ducked in and out of the cabin until 3:00 a.m. that morning, checking to see if the Lights were becoming more active. The forecast predicted better activity during the following two evenings so eventually we gave in and slept. The next day, we took a walk around the property to a bluff near the cabin. We could see all the way to the next mountains with a flat expanse of land in between and a few stands of trees like ribbons running north to south. With the lingering snow, branches not yet budding for spring, and the frozen Yukon River in the distance, the sparse landscape had the look and feel of The Revenant — minus the grizzly bear (hopefully sleeping). That night, Jay succumbed to the primal need to make fire in the wilderness and built a glowing pyramid in the firepit out front. 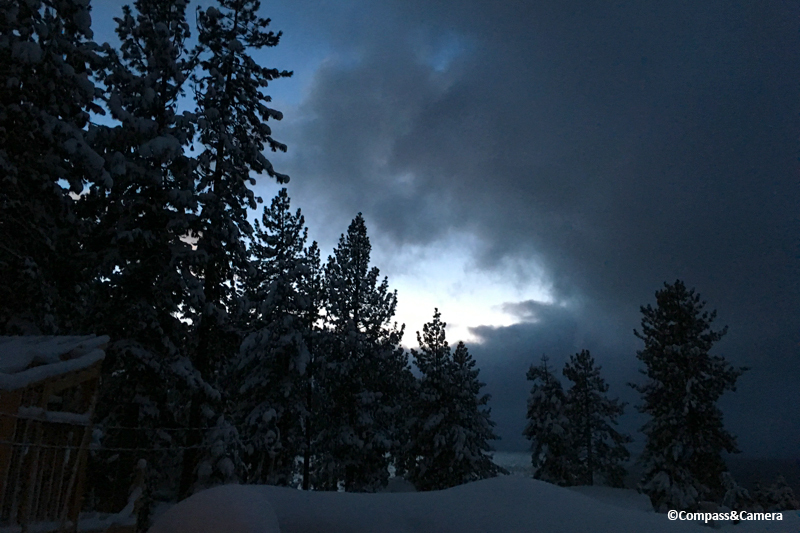 We alternated between the warm cabin and the fireside heat until the wood ran out around 9:00 p.m. At 10:00 p.m., Jay took a look out the front door exclaiming, “The band’s here!” That ethereal green band was getting brighter as darkness finally arrived. 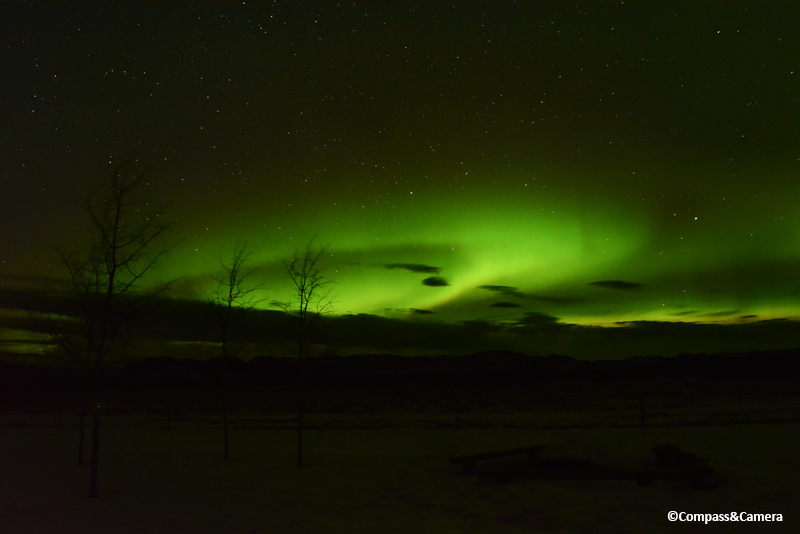 But Aurora activity again remained low and steady throughout our gaze until 2:00 a.m. in the morning. It was easy to see and enjoy with our eyes but not so easy to photograph with a camera. 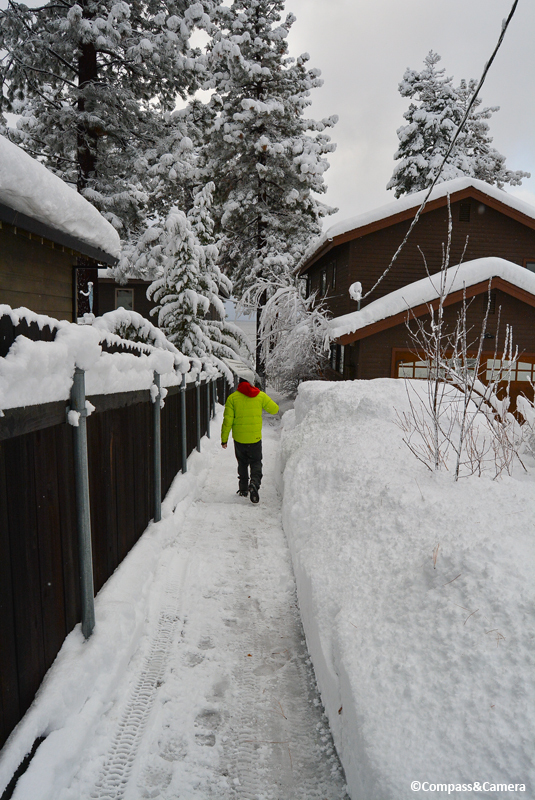 On Sunday, our last full day in Whitehorse, we made the most of it. We drove out to walk on the frozen Yukon River and then went for an evening soak in the local hot springs — a community gathering spot with two large pools at different temperatures. 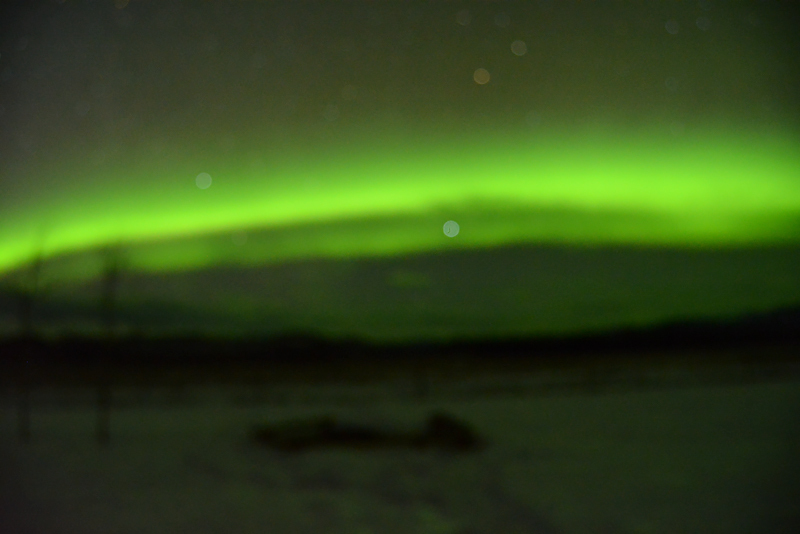 We returned to the cabin and checked the Aurora forecasts, knowing the conditions were right for increased activity. A coronal hole in the sun was releasing solar wind that was striking the atmosphere with high-level intensity as the earth rotated through it. Activity had again been elevated over Scandanavia but tonight it had continued over eastern Canada, too. We knew that if we were lucky we might catch the tail end of the show. We were drinking wine, making dinner, waiting for the sunlight to completely disappear from the western sky. And then … it happened. The band’s here! Brighter and greener than ever. GET THE CAMERA! I was excited, frantic, running around trying to get my camera attached to the cold tripod I had staged on the front porch. Jay was turning off all the lights and, with less and less light to work with, my camera wouldn’t focus on anything. I switched to manual but the scene was so dark through the viewfinder and I was so filled with glee that both IT and I could not focus. FAIL. More attempts, more failures, but pretty nonetheless! I finally had to stop, take a deep breath, and make Jay be my focal point (standing in the front yard holding up a lighter like he was at a Northern Lights concert) to bring the full depth of field into focus. With a few experimental exposures, I finally got it dialed, and captured a shooting star in the process. The most memorable part of the following two hours was something I could barely capture with the camera. 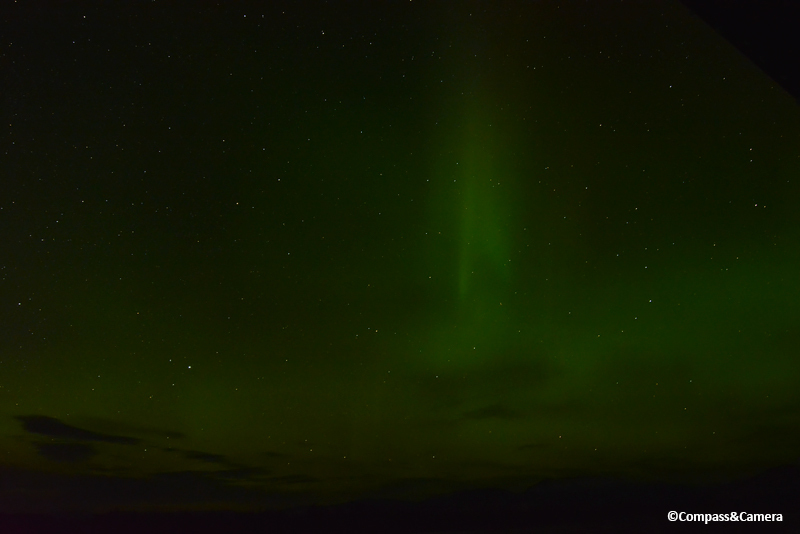 The green band continued to glow, but long fingers of light started to descend from above us down to the horizon. When those disappeared, more fingers would extend from the horizon up into the sky. Sometimes three, four and five at a time would reach down or up, shift left or right … and be gone. THIS was the solar wind blowing through the atmosphere right in front of us. MAGIC! Here was a moment to put down the camera and watch the science and beauty of the Northern Lights as two tiny human beings in an infinite galaxy. As fellow blogger Ron Mitchell often says, “Thank you, Abundant Universe.” We have seen the Lights and they are divine. Travelling, one accepts everything; indignation stays at home. One looks, one listens, one is roused to enthusiasm by the most dreadful things because they are new. Good travellers are heartless. 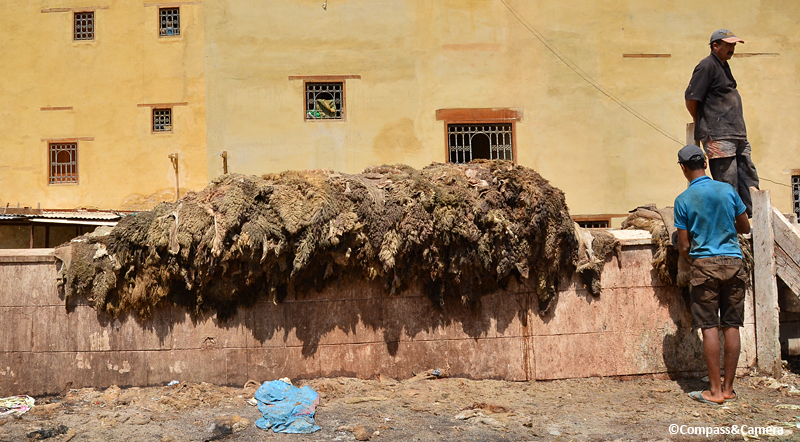 Death hangs constantly in front of us as we visit the Chaouwara tanneries in Fez. In the West, we rarely see where our food comes from, or our leather products come from. 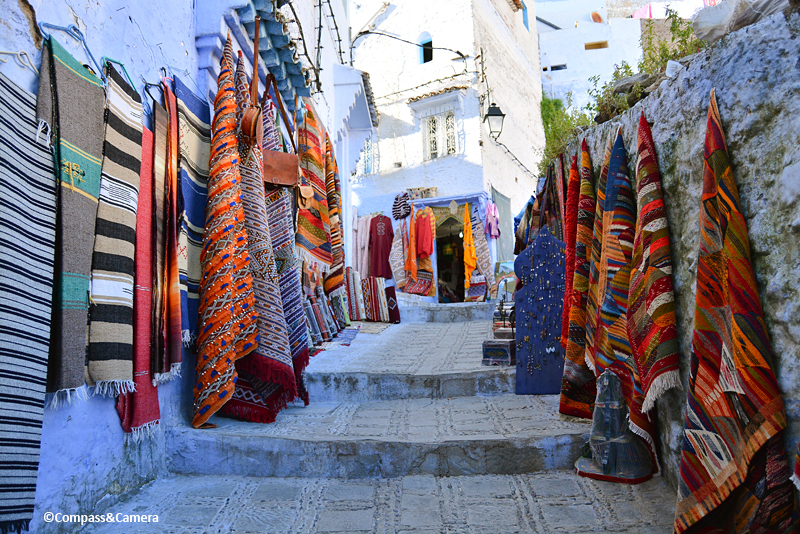 But here in Fez, we confront the truth directly as an aspect of life in Morocco. We wind our way upstairs through the leather shop onto a large terrace overlooking the tanneries. Our guide/salesman gives us a bit of mint to hold in front of our noses to mask the acrid smell of skin, lime, urine and pigeon dung. What’s transpiring in the tubs below is far less glamorous than all the colorful leather products on display inside. The process of tanning leather by hand is arduous and toxic. Hair and flesh is removed from animal hides (mostly goat, from what we can tell) through techniques like soaking, salting, liming and scudding (trimming). Hides are submerged for hours or days and treated with enzymes and acids. In a sort of morbid, closed-loop production process, the natural byproducts of life — salt, urine and dung; from numerous sources — is applied to the hides to preserve them, make them pliable, and condition them for their end use. Only some of the men working these tanneries wear gloves and boots. Others are submerged thigh-high, unprotected into watery contents of every color. No one wears a mask. This is a job that endangers and shortens lives. What looks like mad chemistry to us surely has order and process from centuries of practice. Each man carries out his task alone. Hides go in, hides come out. Hides are dyed in various hues and set aside to dry. Nature holds an entire palette of plant-based, natural dyes but these days many colors are achieved through the use of unhealthy synthetic chemicals that pollute bodies and environments. 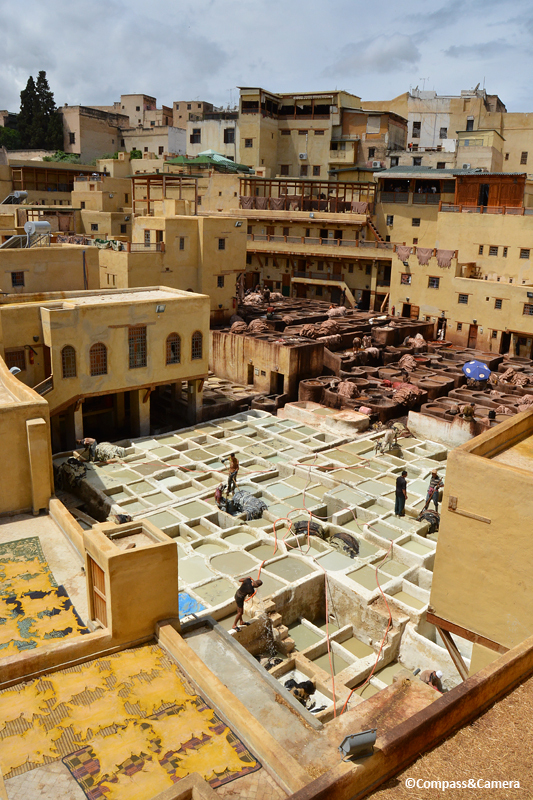 Dry hides are carried out and somewhere in some room within the labyrinth of Fez, workers are busy sewing the skin into shoes, skirts, jackets and handbags — made to order if you can’t find exactly what you’re looking for in the shop. Wandering through Fez the following day, we meet a boy on the street who offers to show us another tannery. We follow him down a few narrow paths to a sturdy wooden door. Behind the door we find more death — enormous piles of hides with the hair still attached, somehow seeming more alive than the hides from yesterday. 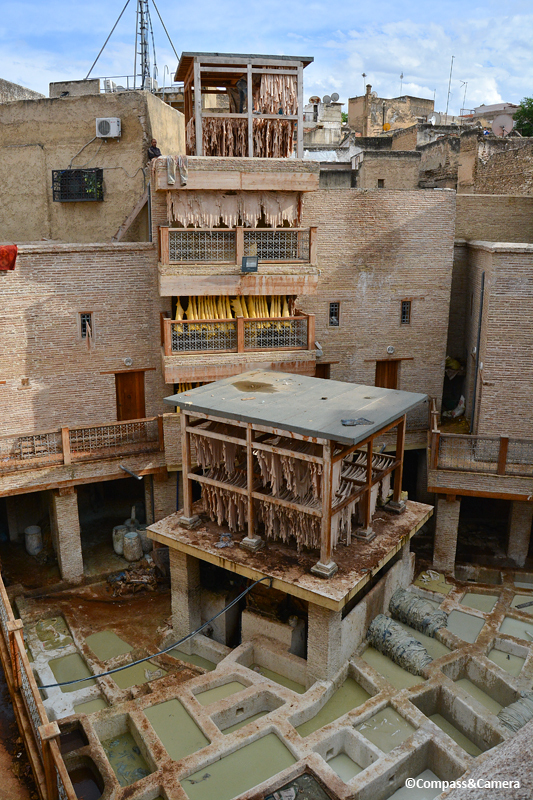 This tannery is a smaller operation. The tubs sit at ground level surrounded on all sides by stairs, balconies, drying racks and doorways leading to the unknown — maybe housing for the men who work here. 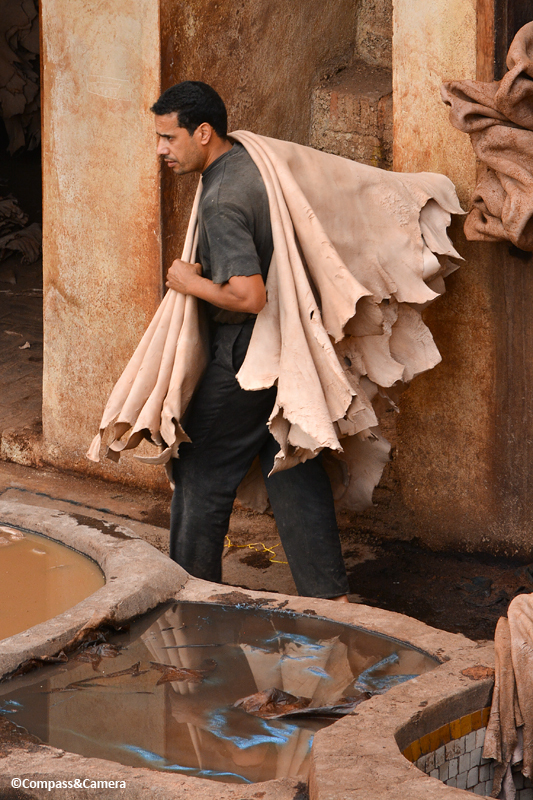 Most men working the tanneries are born into the job and carry it out for a lifetime. But many of them suffer from exposure to toxins through their skin and lungs. Breathing at a tannery for just ten minutes is proof enough that this a dangerous job. But for these workers it’s a way of life in an industry that shows increasing worldwide demand for beautiful leather goods from companies like Coach, Hermès, Louis Vuitton, Prada and even VF Corporation (a company I used to work for). Do you think it’s ready? At the top of the stairs we emerge onto a rooftop where more skins are drying but the view of the blue sky feels hopeful and fresh. Our young guide shows us the bags of pigeon dung on the way out — collected and sold to the tanneries from a town nearby. As always, traveling has taught me another lesson: be aware of the lives you affect by the choices you make. Do I really need a pair of those blue Moroccan slippers? Judging by their pretty design, one would never suspect the pain behind the product. Do you know where your pouf is from? 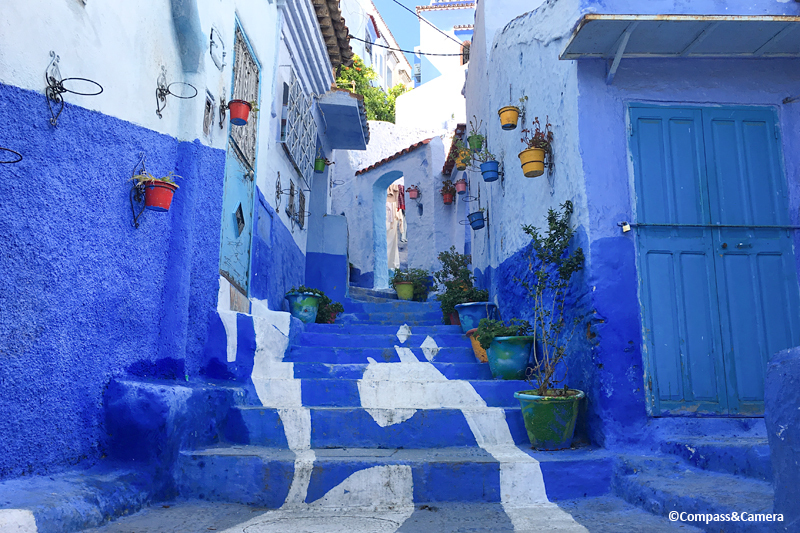 Throughout this post you’ll find the words of author Paul Bowles, an American expatriate who lived in Tangier, Morocco for 50 years. He wrote an essay called “Fez” in 1984. His thoughts on the city still ring true today. I’ve interwoven my story with excerpts from his essay, noted as italic quotations. We ride the train from Tangier to Fez on a rainy afternoon in Morocco. If we’re going to spend a vacation day inside, it might as well be on a train moving across the countryside. We pass hills of green and gold which hint at the Atlas Mountains and Sahara Desert beyond. 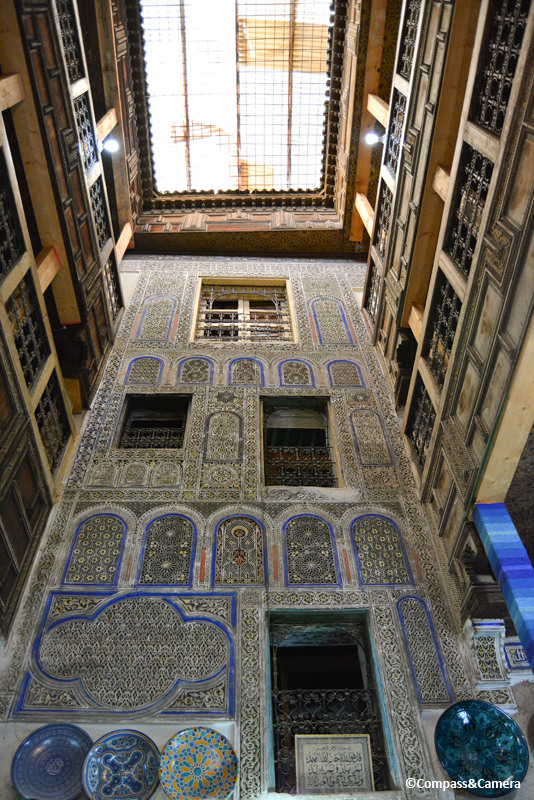 Upon arrival at the station in Fez, we find a taxi and ask the driver to call for directions to our riad. It’s low season and we made a reservation just two days earlier after I searched obsessively online for a bit of affordable luxury, as much as that sounds like a contradiction. 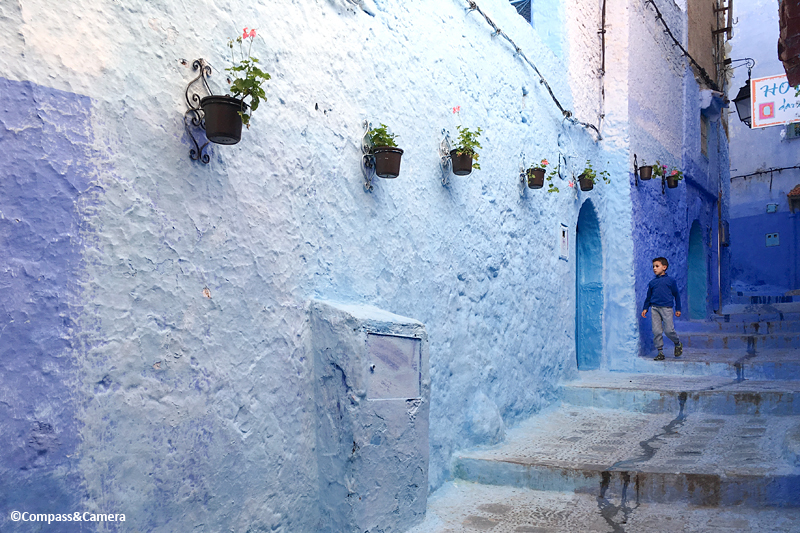 If there’s anywhere worth splashing out for a night or two, it’s Morocco. 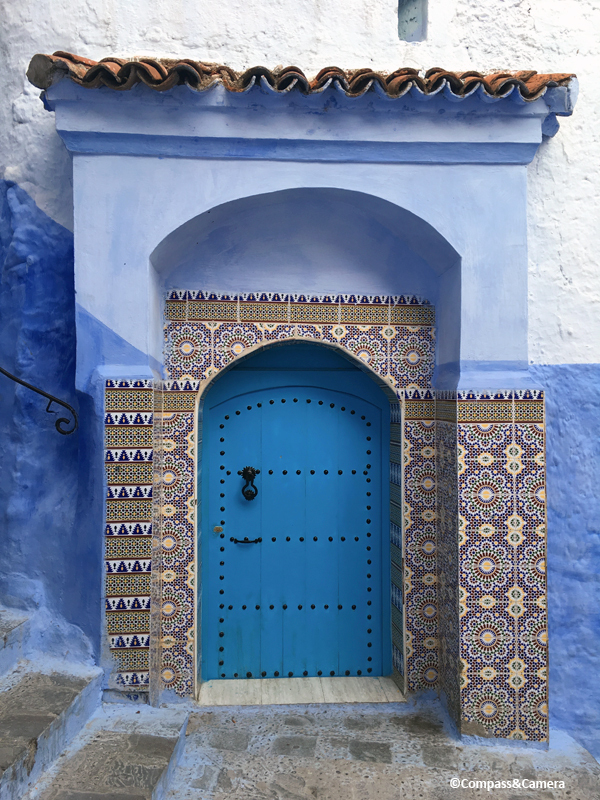 The experience of staying in a beautiful riad has a permanent place on my bucket list. Our destination is Karawan Riad. A man with a wheelbarrow meets us at the taxi drop-off. We push our bags through the busy paths of the medina until we arrive at a dark little doorway so unremarkable I don’t even think to take a photo. The door opens and we’re welcomed inside. 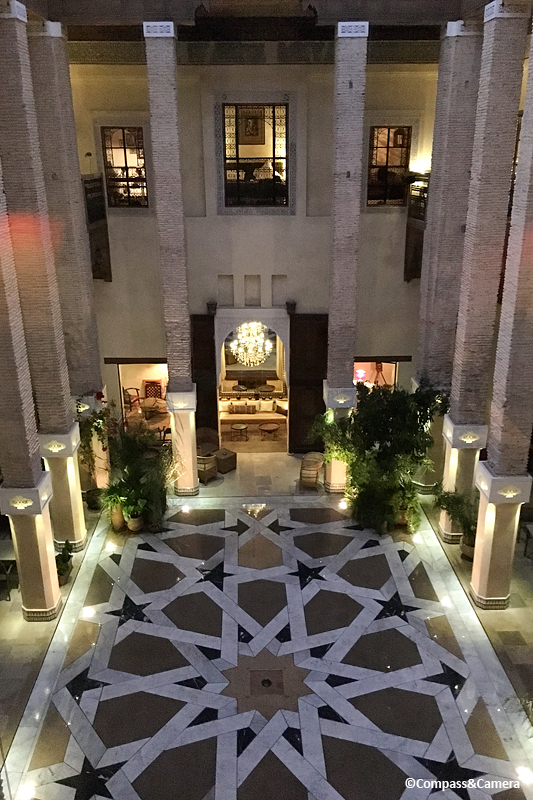 Karawan Riad is a gorgeous discovery – grand and beautiful while authentic and understated. My favorite feature is the five-fold geometric design in the floor tile of the inner courtyard which opens to the sky. We’ve been upgraded to the extravagant Dzhari suite. We have no idea why until later when we talk with an American couple on the rooftop terrace who tell us they requested to move OUT of the Dzhari suite because the floor plan was too big and unmanageable with an upstairs bathroom. Thanks for the unexpected gift! 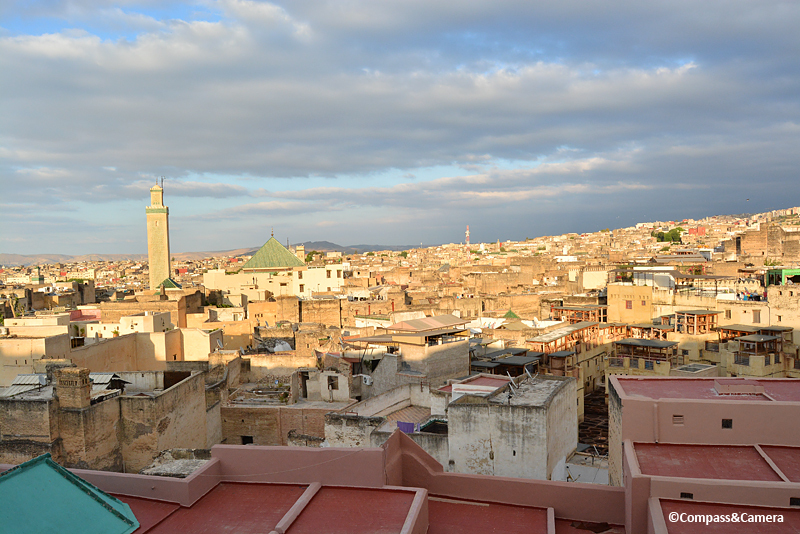 We stand at the edge and get our first panoramic view of Fez. The city is sprawling, endless and so tightly packed that not even a single road draws a line through the density. How and where do we begin to explore this anomaly? Idris I, the first dynastic ruler of the area that would become Morocco, designated Fez as the capital city. The year was 798 and Idris I died shortly after this, leaving his son Idris II to carry out his plan. In the centuries since, the walls of Fez’s medina have been torn down, expanded and rebuilt with some still standing since the 13th century. 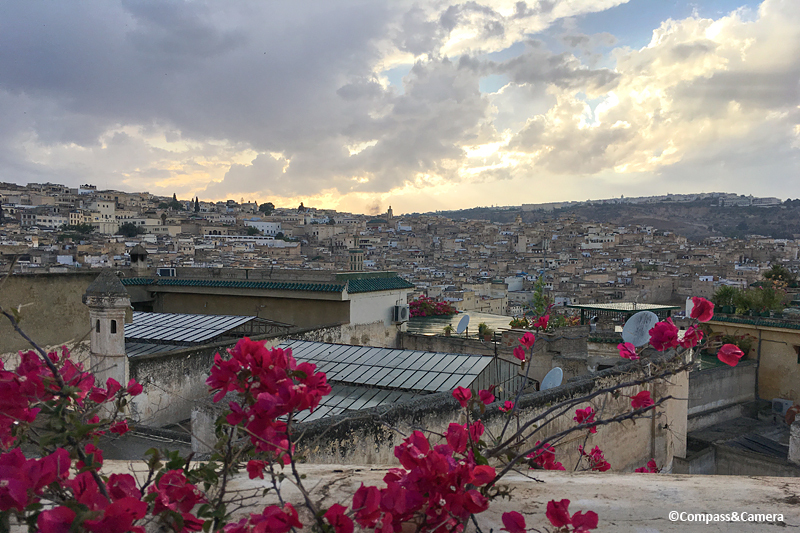 Throughout its history, Fez has been the site of frequent conflict between Arabs, Berbers and Jews living in the city, with additional periods of Ottoman and French control during the past several centuries. 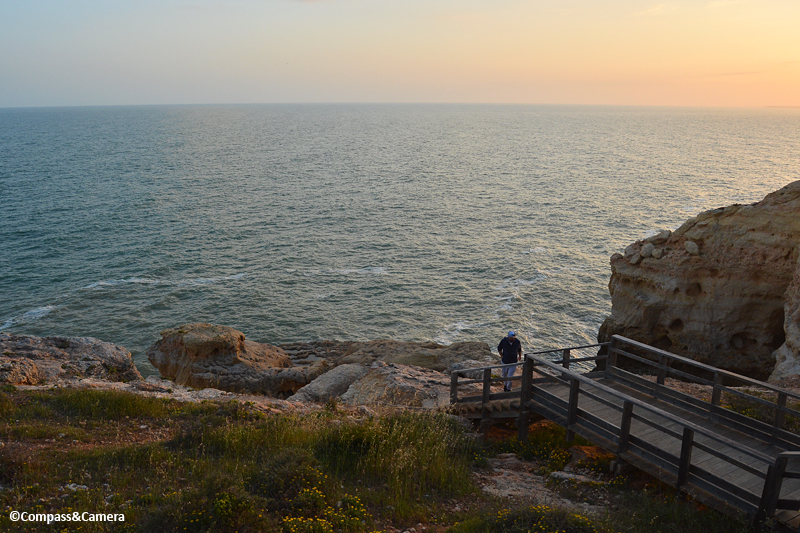 The French moved the capital to Rabat in 1912 and Morocco became independent in 1956. We dive in the next morning after a lovely breakfast at the riad. 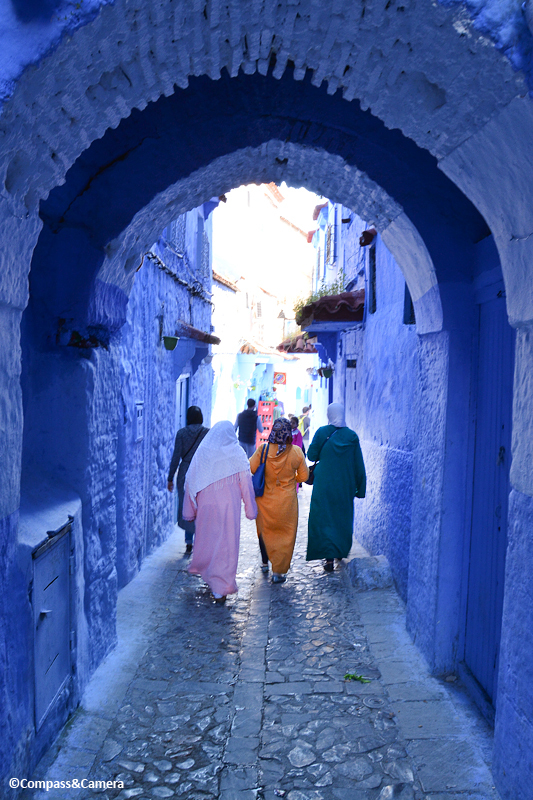 There is no good way to begin exploring the medina other than by just walking into it. With wide-eyed, curious expressions on our faces, a few people offer to show us around but we have all day to be lost and found on our own. We pass small doorways and alleys leading to even smaller doorways and alleys. We navigate by curiosity and intuition, and with every turn we feel one more step away from knowing how to get back to where we started. Deeper into it with every step, we get bolder and braver – peeking our heads into doorways and climbing stairs to see where they lead. The reward is the discovery of incredible interiors – some old and rustic, others elegant and refined. There is certainly an exotic other world behind these tall, quiet walls. Eventually we come to a long passageway with latticework shading the interior. 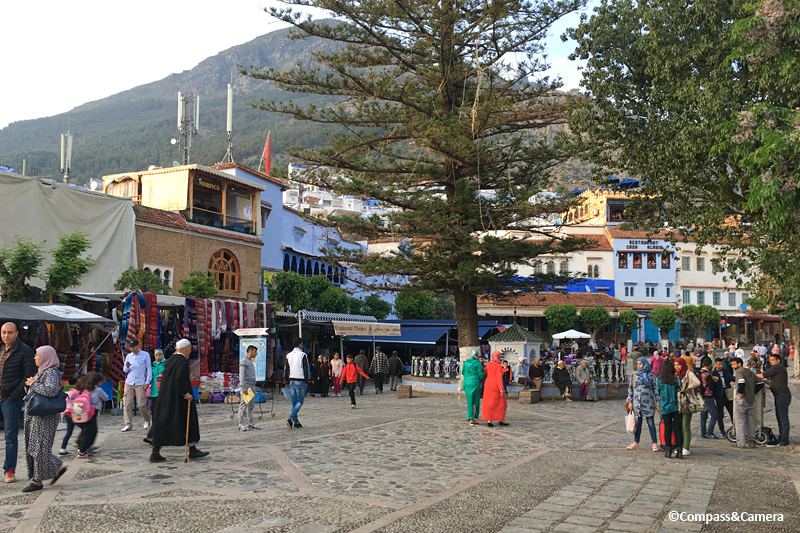 We’ve arrived at a major artery of the medina which leads us to a maze of vendors who lure us with all kinds of things for sale — textiles, rugs, lamps, leather goods, ceramics, clothing, baskets, spices and more. Fez is far less aggressive than Marrakech and there is no hard sell. 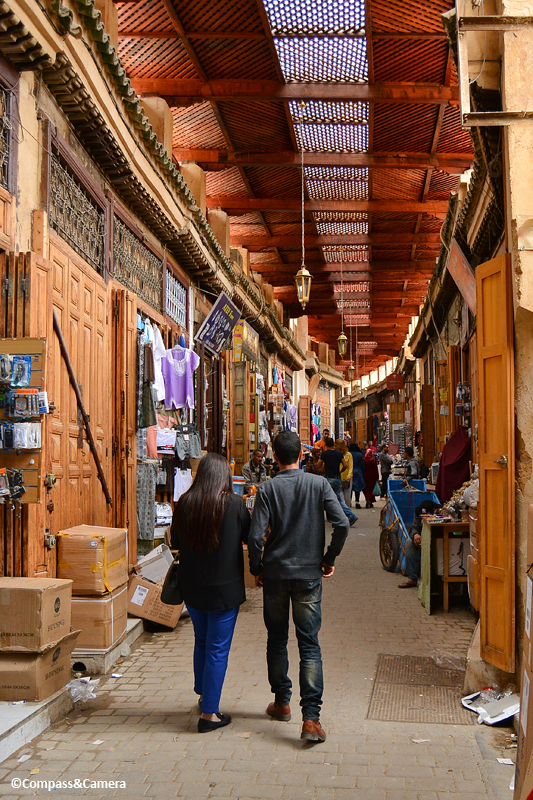 We wander through the henna souq, Brassmaker’s Square and the Jewish quarter. By this point we have no idea where we are in relation to where we started. 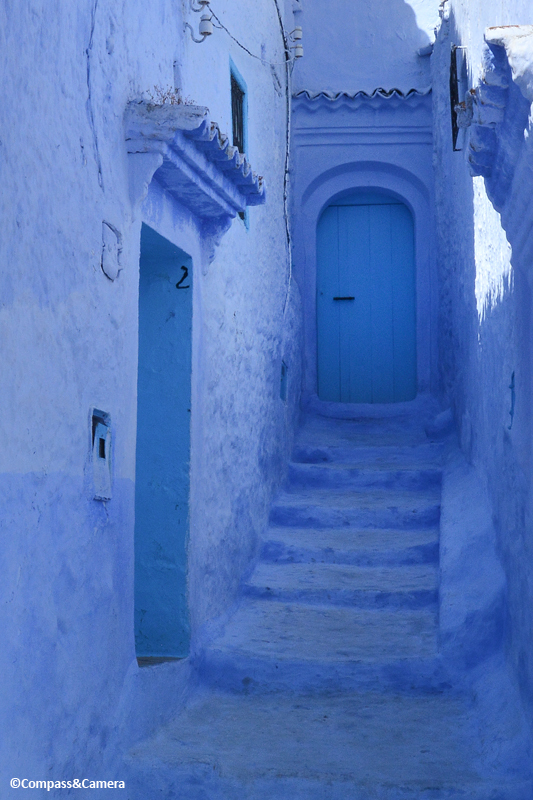 The medina is vast and the walls are just too high to glean any true sense of direction. But we’re finding more and more pockets of life and beauty that pull us through the maze. The deeper we go, the more textures and colors we see. The medina blooms around us. Fez has cast its spell on me. The artistry of the city speaks through the bespoke quality of every single door, window, design, pattern, display and handmade item. Every element of this city has a human fingerprint. Nothing is manufactured and in this way Fez feels truly unique. I cannot walk into a shop and buy eight of the same bowls, four of the same pillows, or two of the same rugs. They simply don’t exist. I can look through a stack of 20 plates and no two will have the same pattern and color. It’s easier to have a pair of leather slippers custom made than to find my size and favorite color among a wall of one hundred choices. Craftspeople here can make one hundred of whatever you like — but the end result will still be one hundred handmade things, each imperfect and unique. 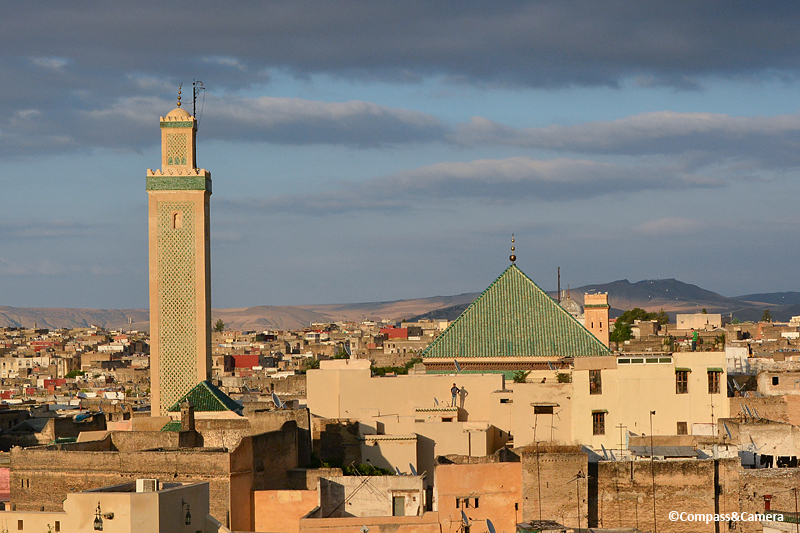 In a manufactured world, Fez is an astonishing city of authentic art and identity. After a long day on our feet, we finally sit down for dinner at a pretty restaurant smothered in tile overlooking the medina. We’ve been unknowingly sucked into a tourist trap with an expensive fixed menu in a bunch of languages. We hurry through our tagines so we can get back and relax in our palatial room at the riad. The next day we embark on another adventure through the medina. We find more doorways and details around every corner and spend quite a bit of time exploring the tanneries (an experience of such impact I’m doing a whole post about it, coming soon). 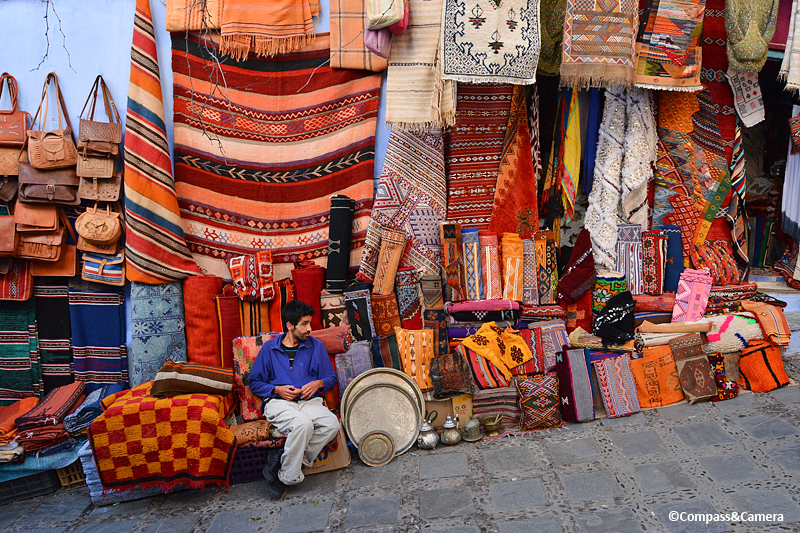 We find ourselves at Bab Bou Jeloud square and walk through the produce market nearby. Much like Tangier, the variety on display is as surprising as the verdant countryside we saw from the train. We squeeze into two plastic chairs at a stall serving some kind of meat sandwich on Morocco’s traditional bread, which kind of looks like a Frisbee. We share with the cats and kittens lingering in the lane behind us. We continue our journey, intent on finding a “set” of plates to take home with us – knowing each piece of the set will be unique because … Fez. We step down into a shop filled wall-to-wall with beautiful ceramics. The shop has been family-owned for several generations – son, father, grandfather and beyond – and the entire three-story structure above us is part of the family home. It’s more than 100 years old with intricate detail in the carvings going up one wall. 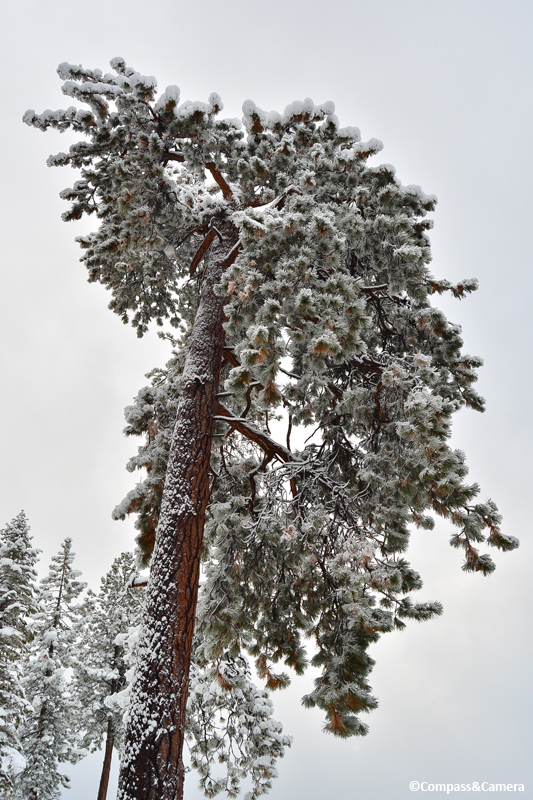 The father recalls being a little boy, climbing high up the woodwork. 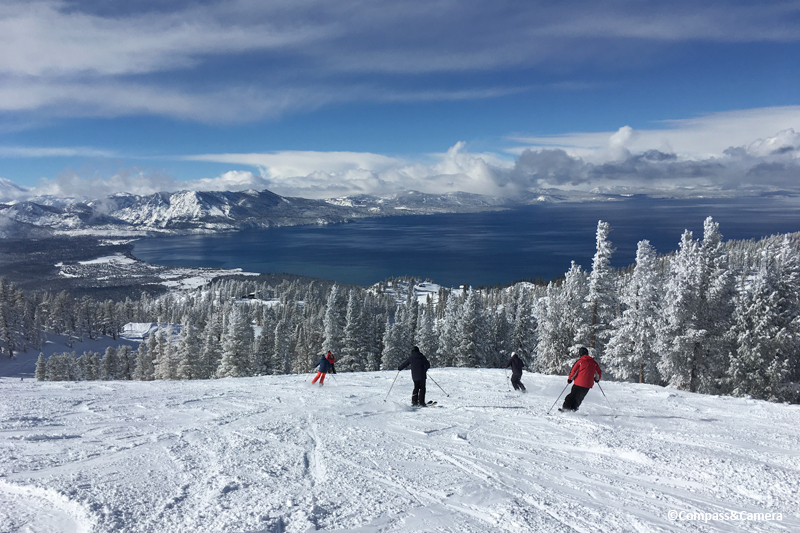 While we assemble our set of plates the son asks us if we’d like to see the view from their home. He takes us across the footpath in front of the store, up a tiny, dark staircase to an adjoining part of the house that opens onto a balcony. 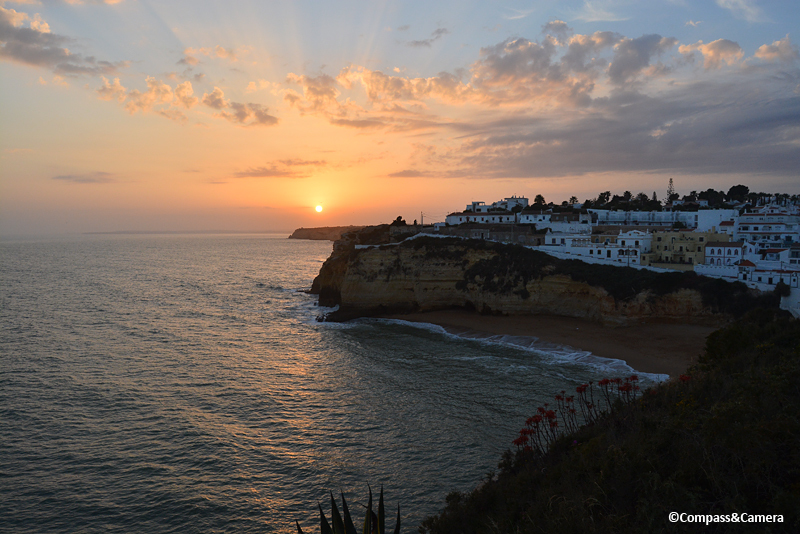 The day is coming to an end and we see several people who have found their way to the upper reaches of the medina for the sunset. 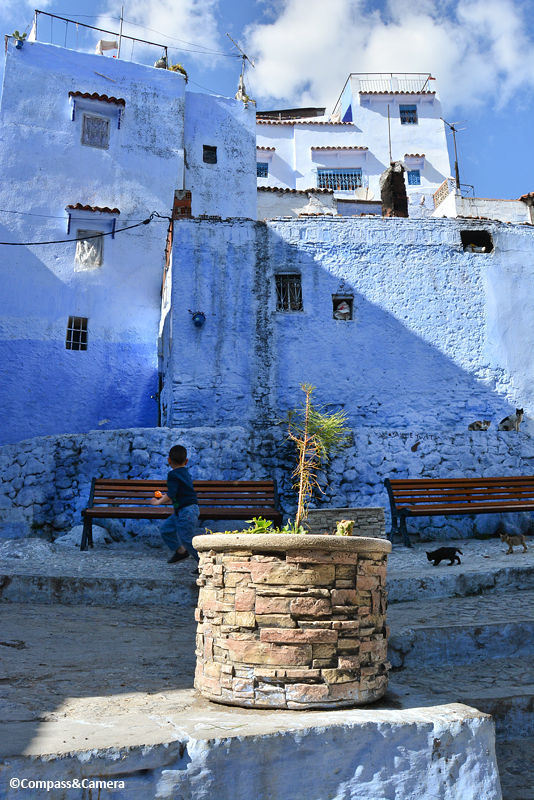 For the second time in Morocco, we’ve been treated to an unexpected view through the gracious gesture of a local. 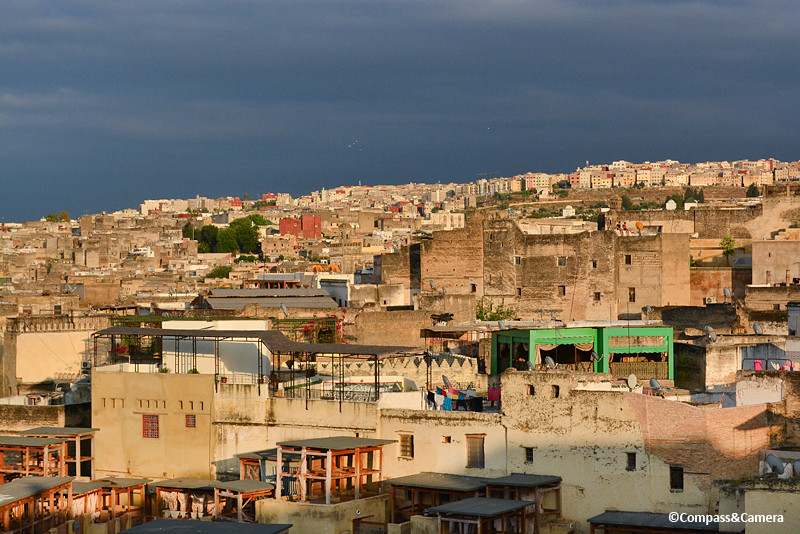 Fez is a grand world city unlike any other — a work of art and life from centuries of self-expression. We look out over the cityscape, share the experience with our new Moroccan friend and his brother, and are reminded again of some of the simple things in life that bring foreigners and locals together: sunsets, beautiful views, friendship and cultural differences which inspire us to invite each other into our homes to talk, to learn and to know respect for one another.